Heat oven to 400°F. Spray 13x9-inch (3-quart) glass baking dish with cooking spray. Brush both sides of chicken with oil. Sprinkle both sides with parsley, seasoned salt, garlic pepper and basil. Place in baking dish. Bake uncovered 25 to 35 minutes or until juice of chicken is no longer pink when centres of thickest pieces are cut. Cool chicken 10 to 15 minutes. 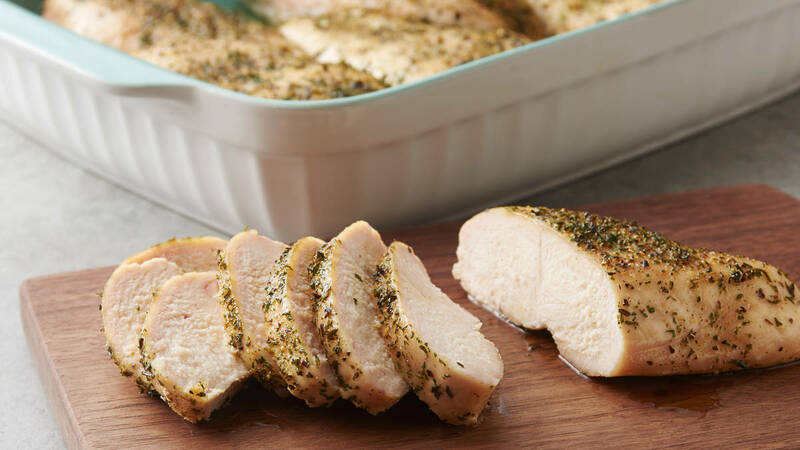 Cut into desired size pieces for recipes calling for cooked chicken. Wrap tightly and refrigerate up to 2 days or freeze up to 1 month. To check doneness, cut into chicken piece to make sure that juices run clear and are no longer pink.